I'm not fretting about Fletcher Cox. As Derek Sarley laid out quite plainly, the problem on those first few run plays was much more about spacing in the new 3-4 defensive lineup. The bigger problem was Trent Cole, who looked totally out of place as a stand-up linebacker. Maybe he'll get better, but I wouldn't count on it. The sample size wasn't large, but I thought Brandon Graham looked a lot more comfortable out there. 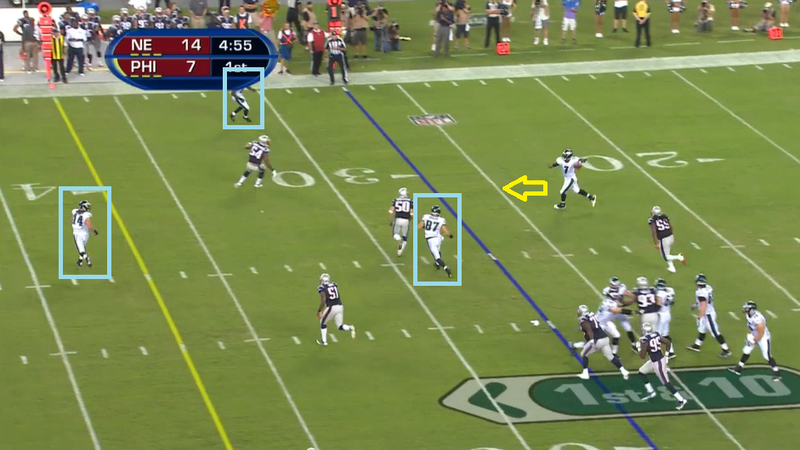 In nickel packages the Eagles tended to switch to a four-down linemen look, and Cole looked like his normal self there. Back in April I suggested that the coaches keep Cole as a down rusher -- even consider starting him at 3-4 defensive end. That latter option is probably off the table now that Cole has slimmed down for his OLB role, but I wouldn't be surprised to see him has a dedicated pass rush specialist in exclusive four-linemen looks before long. As a broader point, the 3-4 defensive transition is going to be rough. Not only do some of the players not fit into their defined roles, but the spacing issues will probably continue. Good offensive coaches will exploit this inexperienced front, and Mychal Kendricks and DeMeco Ryans are going to get mauled at the second level. On the touchdown pass, Sheil Kapadia says: "Vick said [DeSean] went deep because the Patriots had a single high safety." Jackson's ability to stretch coverage is even more necessary now that Jeremy Maclin is out for the year. If can't keep safeties honest, the run game and short passes become difficult. Just as I was drawing this play up, Chris Brown posted an extensive review of Chip's play calling, including this one (with a gif). You should definitely check that out. Brown talks about "packaged plays" as well, and Sheil has a glorious medley of screen caps on those run-pass options. Lane Johnson looked athletic and powerful. Sheil had good shots of him pancaking defenders and getting to the second level: here and here. Fellow Eagles Almanac scribe Dan Klausner is trying to convince me that Chris Polk is ready for the big time. I'm open to the idea, but haven't seen it yet. Certainly he is the better pass blocker (see Sheil's screencaps here), but Bryce Brown is a much more dangerous weapon. Watching him explode through holes or grab passes out of the backfield, it's obvious that Brown's someone you want to have the ball. Perhaps it's a silly hypothetical, but I can't shake the feeling that Brown would have exploded through that hole for a first down on the Wilfork zone-read. Nick Foles moved the ball very efficiently in the Eagles' first real up tempo test. See more from Jimmy Kempski. For much much more on everything Chip Kelly and the Birds, buy the Eagles Almanac! Tagged with Philadelphia Eagles, NFL, New England Patriots, Preseason, Chip Kelly, Nick Foles, Michael Vick, Chris Polk, Chris Brown, Bryce Brown, Lane Johnson, Sheil Kapadia, Dan Klausner, Jimmy Kempski, Derek Sarley, Trent Cole, Zach Ertz, Brandon Graham, Fletcher Cox, DeSean Jackson, Zone Read, Read Option, Up Tempo, Run Blocking, Run Defense. August 12, 2013 by Brian Solomon.